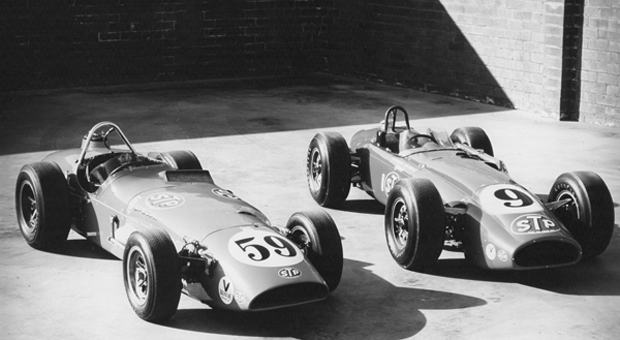 1965 was a transitional time in Indy racing. That year, only 6 cars in the race still used a front-engine design. Andy Granatelli, then CEO of STP, outfitted all Novi crew members with STP “pajamas.” He wore an STP logo-bedecked suit himself, complete with tie. He also painted whitewalls on the cars for easier identification. 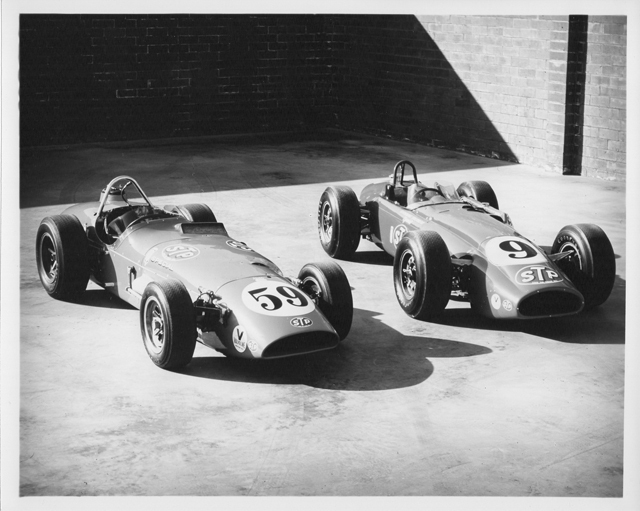 Granatelli’s team used the Novi engine from 1961 to 1965, finally developing a four-wheel-drive version, trying to harness the power. The Novi engine was last used at Indy in 1966, when a qualifying crash ended its career. Despite never powering a race winner, few engines have become as much of a ‘celebrity’ in automobile racing as the Novi engine. The final STP-version of the Novi V-8 had a revised two-stage centrifugal with a power output of 837 horsepower at 8,200 rpm. In this 1965 press photo, we have Bobby Unser’s Number 9 Novi-powered car that ran a Ferguson AWD system. Granatelli later used the Ferguson technology on other Indy racecars. Eventually, Indy outlawed AWD when Granatelli’s cars were deemed unbeatable. Unser finished 19th, at the 1965 Indy 500, succumbing to an oil fitting failure. Jim Hurtubise’s number 59 Novi qualified 23rd but left the race after one lap with a busted transmission. He finished last. But it was his car’s paint scheme that made the car memorable. It was hot reddish/orange with gold leaf lettering. The car would later be painted blue and yellow. Hurtubise finished 33rd at Indy in 1965, due to a transmission failure.